You may be thinking "powder room design isn't at the top of my wish-list". 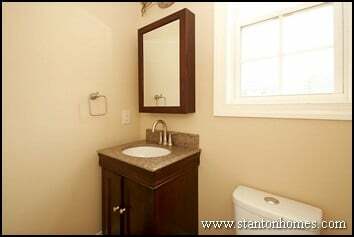 But making your new home powder room stand out doesn't have to be time-consuming, difficult, or expensive! Take a look at these recently completed Raleigh NC custom homes, and get low-cost custom design ideas for your new home. Then, let our interior design team guide you through the entire process, with tips and tricks that will inspire your home. These powder rooms pack a lot of style into a small amount of space - and these designs won't break your budget. Ask us what we can design just for you. 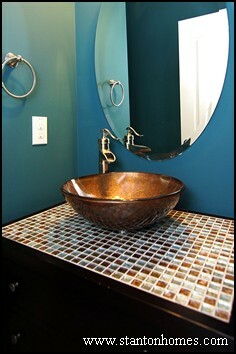 This mosaic tile vanity top is gorgeous - with specs of gold chosen to perfectly match the vessel sink on top. 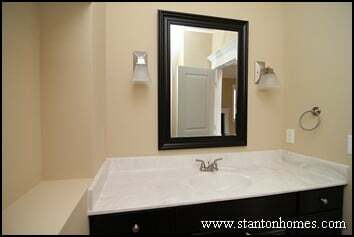 The powder room does not require any custom modifications - just switch out the vanity and sink. 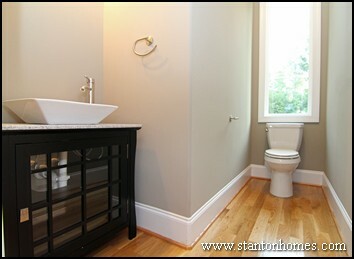 Carry the hardwoods from your foyer (or great room/kitchen, depending on the floor plan layout) into the powder room. You will be adding very little square footage of hardwood (most powder rooms are designed with dimensions of 5x5 or 3x6 feet). 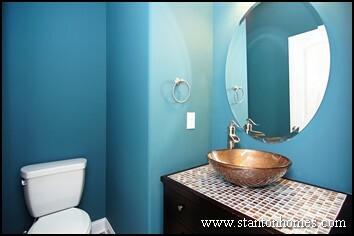 The Powder Room can feel larger and more continuous when finished in hardwood rather than tile or vinyl flooring. This powder room is eye-catching, with clean black and white lines. Why do home buyers love this design so much? You can see it for yourself! 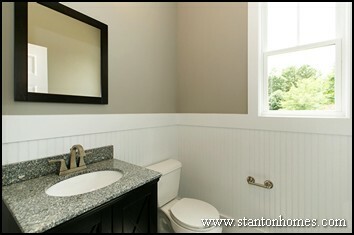 A custom wainscoting treatment provides an upscale, formal look to the room - at minimal cost. The "black and white" color scheme has been one of the top choices this year. - Large built-in art niche designed to fit a favorite oversized art piece. What isn't stylish about saving water? This custom home powder room features a dual flush toilet system, designed for water (and cost) savings. A stainless steel sink faucet, towel holder, light fixture, and hardware make this powder room modern and sleek. Stanton Homes recommends the use of WaterSense certified low-flow fixtures, which offer flows 20% lower than federal requirements.